DPD and HydroACT Comparison | Chemtrac, Inc.
DPD colorimetric measurement is highly regarded among municipalities as the preferred method for on-line chlorine analysis. Recently, however, EPA Method 334.0 established the criteria for approving alternative on-line chlorine instrumentation including amperometric probes. Potential customers need to be aware that not all amperometric probes perform acceptably under Method 334.0 standards. HydroACT amperometric probes distinguish themselves among the rest by employing a patented and proven technology of a buffered electrolyte. This technology permits HydroACT probes to operate over a much broader pH range and still provide reliable chlorine readings. To demonstrate how their chlorine analyzer compares to on-line DPD measurement, Chemtrac partnered with several municipalities to produce the following head-to-head comparison. Without stopping at on-line analysis, Chemtrac also compared their system to the latest bench-top DPD chlorine measurement which is considered the standard under Method 334.0. 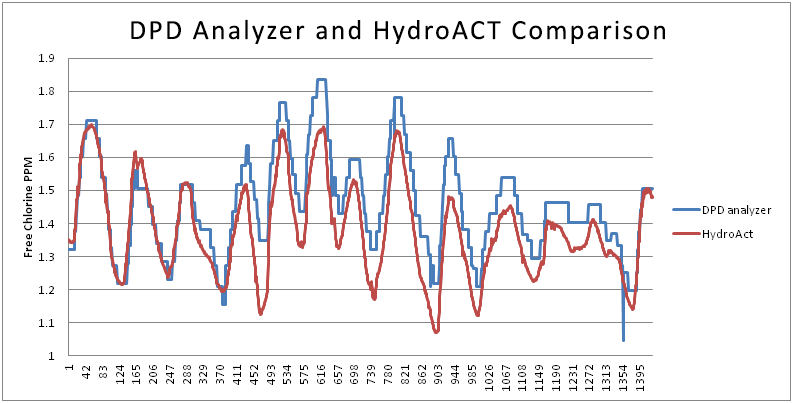 From the comparison graphs below, it is easy to see that Chemtrac’s HydroACT amperometric probesare closer to the standard than some on-line DPD analyzers. For more information concerning Chemtrac’s line of HydroACT analyzers equipped with their latest amperometric probes, please call @ 800-442-8722 or use our contact form.